World Series Mystery: Did This Ball Break Up Bevens’ No-Hitter in 1947? 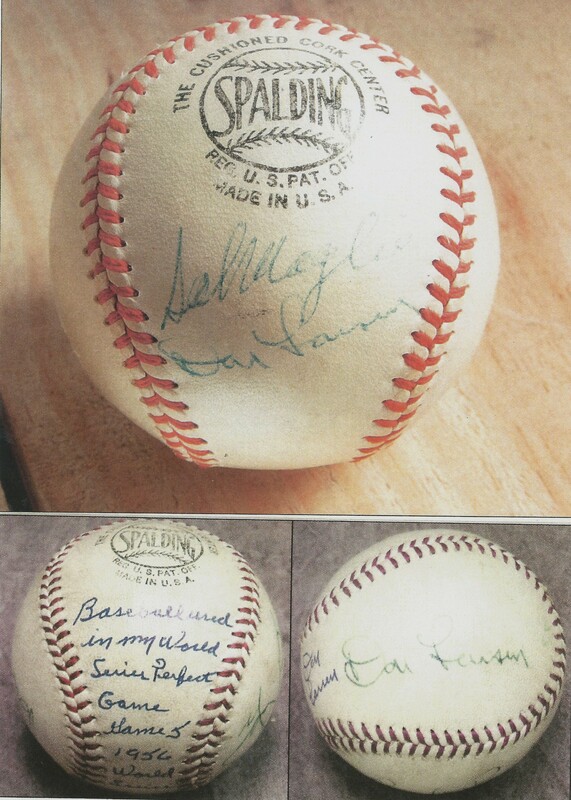 Did Yogi Berra Authenticate It For Barry Halper? Did Cookie Lavagetto hit this ball to break up a No-Hitter in the 1947 World Series. Heritage states in the lot description that the ball is an “Official AL Harridge” baseball. However, Game 4 of the 1947 World Series was played at Ebbets Field and per long-standing baseball traditions, a National League Ford Frick ball would have been furnished by the home club for use during Bevens’ almost-no-hitter. So, how could this AL ball be the one that was crushed by Cookie Lavagetto on that fateful day in 1947? The notation "1947 World Series" appears to be period, but the "Last out" notation was added in more recent times with Bevens' alleged signature. 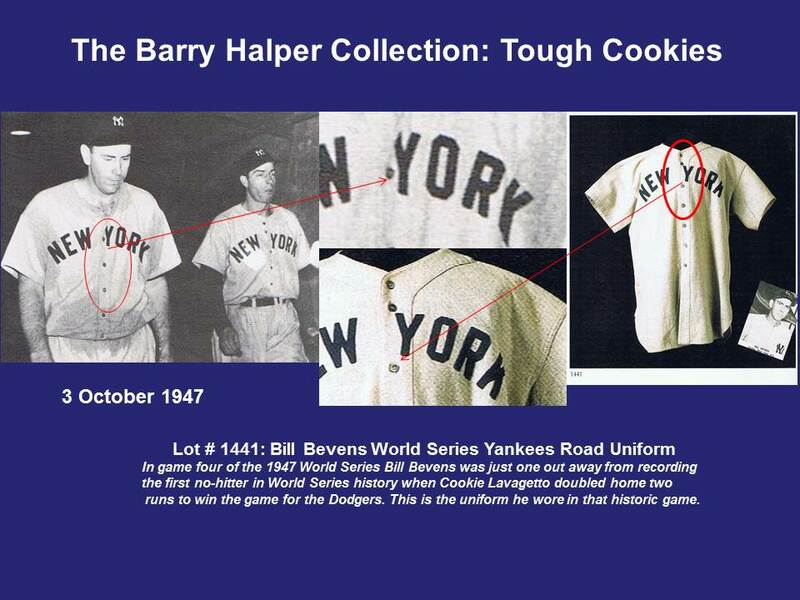 Before we further examine the ball itself, we should note that Halper’s jersey, which sold at Sotheby’s in 1999 for $8,000 was also NOT Bevens’ jersey from the day he almost pitched a no-hitter. It is clearly shown in photographs taken on Oct. 3, 1947, that the button placement on Bevens’ jersey does not match that of the Halper jersey. Considering the numerous authenticity problems with Halper’s uniform holdings and the documented fraud involved in his issuing multiple and false provenance statements for other items (including a million-dollar “Shoeless” Joe Jackson jersey that was determined to be a fake after he sold it to the Baseball Hall of Fame), considerable doubt has been cast on on the legitimacy of the Bevens ball. The alleged Bevens ball being offered by Heritage was also previously sold at auction. It was first offered by Lelands in May of 2002 as lot 1231 but did not sell with a reserve of $10,000. In December of 2002, Lelands auctioned it off again as Lot 769, where it sold this time for $6,111.88. Unlike the alleged 1947 jersey that sold at Sotheby’s in 1999, the ball was not accompanied with an LOA from Bevens. Lelands only stated that the ball was accompanied by an “LOA. Ex-Barry Halper Collection.” The Berra and Halper letters accompanying the current Heritage lot were written after the Lelands auction in January and March of 2003. Lelands didn’t mention the fact that Bevens’ alleged signature graced an official AL ball. Our research has found that verifiable and important game-used World Series baseballs from the post-1920 period feature the league markings of the team that was hosting the World Series game. 1977 was the last year both NL and AL balls were used in World Series play. Reggie Jackson hit this OAL ball for his third home run at Yankee Stadium. 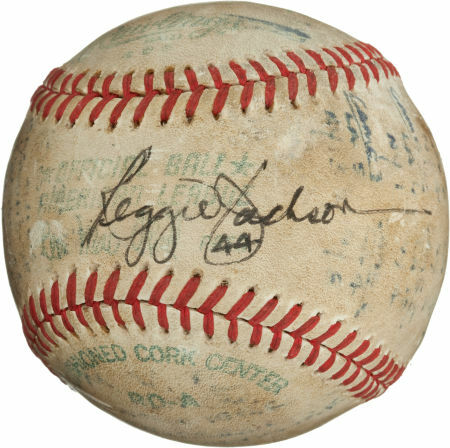 1977 World Series- Reggie Jackson’s 3rd HR ball from Yankee Stadium game, all Official AL balls (This ball is also in Heritage’s current auction). 1956 World Series- Don Larsen’s Perfect Game last out ball at Yankee Stadium, markings are not clear but appears to be Official AL ball. 1956 World Series- Don Larsen’s Perfect Game, game used ball at Yankee Stadium, Official AL ball. (Consigned to Christie’s in 1994 by NY Daily Mirror sportswriter Lawrence Lewin). 1953 World Series- Carl Erskine’s “11 Strike-Out Game 3 Ball,” at Ebbets Field, Official NL ball. (Museum of NYC Exhibition, loan from State Senator Edward Ford). Don Larsen signed these two National League balls for the recipients on the day of his perfect ga,me in 1956. Years later he claimed both were actually used in the game as well. Lelands sold another ball alleged to be from Larsen’s perfect game which also was an official National League Warren Giles ball. That ball was sold in 2005 and was allegedly signed by Larsen and Sal Maglie “immediately after the game” for pro basketball player “Moose” Miller. The ball was accompanied by LOAs from Miller and Don Larsen. Miller said umpire Tom Gorman gave him the ball “minutes after” the game ended. 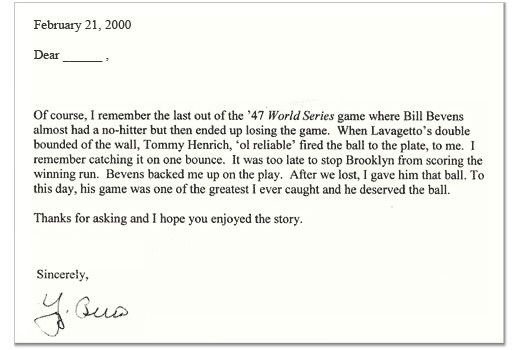 Seth Swirsky posted this letter from Yogi Berra describing how he gave Bill Bevens the last out ball from Game Four of the 1947 World Series. Heritage’s current lot description states that, “Berra’s letter is addressed to famed collector Barry Halper.” It appears that in the letter Berra is just conveying his recollections of giving Bevens the last out ball and does not specifically mention Halper’s ball, which was claimed to have been acquired directly from Bevens. Despite that fact, Heritage Auctions describes Yogi’s correspondence as a “letter of provenance.” The Berra letter Swirsky posted on his website was dated February 21, 2000, but the letter that accompanies the Heritage ball is dated January 14, 2003. The bodies of both letters are identical, as are the Berra signature. Only the dates differ. We contacted the Yogi Berra Museum in Montclair, New Jersey, to see what Berra and Museum representatives thought about Heritage’s characterization of his letter in their lot description of the alleged Bevens ball. We also inquired whether the museum had any other World Series game balls from Yogi’s career. Museum director David Kaplan responded, “Yogi didn’t keep or save any World Series balls. The only one we have on display is a 1947 ball from a donor, but it doesn’t identify which game.” Kaplan continued, “In fact, Yogi tells a story about bringing his 2,000 hit ball home, only to find later his kids had used it to play ball with.” Kaplan directed us to Berra’s sons Tim and Dale for our inquiry about Yogi’s letter to Halper. Dale Berra spoke with us, but declined comment. Neither Dale nor Yogi Berra answered whether the Yankee legend recalled what types of balls were used in World Series play either. To crack this mystery we thought it might help to ask an umpire who actually worked World Series games when both NL and AL balls were used in play and we were able to track down veteran MLB umpire Jim Evans at his umpiring school in Colorado. Evans was on the field when Seth Swirsky’s 1986 World Series ball rolled through Bill Buckner’s legs and on the field when Reggie belted out three home runs in 1977. It was in regard to that series of 1977 that Evans was able to shed some light on the protocol for baseballs used in the Fall Classic. Collecting any game-used item involves a big leap of faith and the alleged Bevens ball still presents more questions than answers. While its not impossible that the ball could have been accidentally put into play that day in 1947, the provenance issues presented by Barry Halper’s misrepresented Bevens jersey compound the doubts already realized due to the league affiliation of the ball. The fact that Yogi Berra won’t answer whether his letter to Halper was an actual “letter of provenance,” as the auction house alleges, just adds more to the mystery. UPDATE: The Bevens Ball sold at Heritage for $5,676 and the “Buckner Ball” sold for $418,250. Jim Evans, not Al Evans. Another fine example of great investigative journalism. This just goes to show how anything halper sold is suspect and should be treated as such. Like i always say, you cannot buy ANYTHING a scammer sells, the odds are it is fake! You could fill a few books with all the scams and fraud done by halper to the hobby. Not only halper, but his modern day counterparts who are continuing with these scams, thank you for reporting them and keeping us informed! that was a good line about 200,000 saying they were at the larsen game. You have to wonder how many people asked larsen to sign balls they said were from the game. How would larsen know they were used in the game? I really think Sherlock Holmes would of loved to uncover all the fraud in baseball memorabilia. 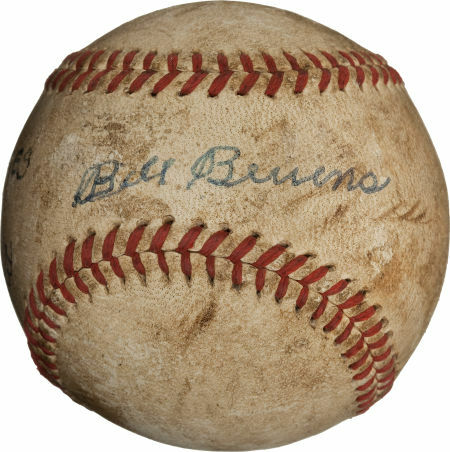 The Buckner ball was bought years ago for @70,000 and sold for over $400,000 this week. The bevens ball was once bought for over $6,000 and sold for less. Guess the halper/yogi story didn’t pay off for the seller like Mookie did.